With the international success of his Berlin Film Festival award-winning film Beijing Bicycle which was inspired by Vittorio De Sica's 1948 Italian neorealist classic The Bicycle Thieves-- writer/director Xiaoshuai Wang (or Wang Xiaoshuai) became an exciting filmmaker to watch as his next two follow-up features Drifters and Shanghai Dreams screened competitively at the Cannes Film Festival where the latter received the festival's Prix du Jury award. With Drifters having already been selected for inclusion in America's prestigious DVD-of-the-Month Club Film Movement, the decision to bring another one of the director's works to viewers around the globe not only spoke highly of the organization's confidence in the filmmaker but also further proof that Wang Xiaoshuai is committed to developing quality works that speak to a universal audience. 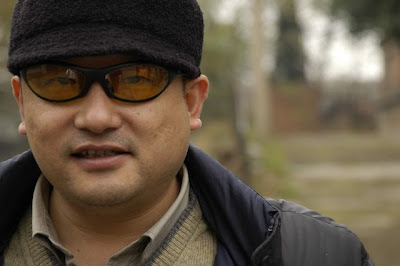 In fact, while some consider the filmmaker more "European" than his fellow Chinese and Asian directors, in the production notes, Wang Xiaoshuai reveals that his goal was simply to tell a story of "a normal, ordinary life that could have taken place in any country" and one that is "above all [about] men and women." It's an important humanistic goal and one he more than achieves with this incredibly timely and intimate story about a group of four adults who must test the limits of their relationships and address their moral and ethical commitments to themselves and each other in order to try and prevent the death of a five year old girl from Leukemia (which the director noted in the press release is a disease that's becoming "increasingly frequent" in his homeland). Admittedly to American filmgoers, the release of the film to own on DVD seems to dovetail nicely into the similarly medically themed big screen adaptation of Jodi Picoult's novel My Sister's Keeper from director Nick Cassavetes starring Cameron Diaz and Abigail Breslin. However while even the preview for that film makes you start involuntarily digging around for tissues, Wang Xiaoshuai said he wanted to "avoid the dramatic side of the situation-- the child's illness and possible death" since he dislikes "tears [and instead prefers] profound and hidden emotions" which he made his primary concern with his opus In Love We Trust. And sure enough, this is exactly what he does in lieu of what would've normally been a two hour tearjerker by introducing us to the five year old Hehe and--confident that her storyline carried with it enough emotional significance-- intriguingly and refreshingly he leaves the medical side out of it in regards to gratuitous scenes of anguish and treatment by instead concentrating on her parents' attempts to give their daughter a fighting chance. When neither Hehe's mother Mei Zhu (the incredible Liu Weiwei) or her ex-husband Xiao Lu (Zhang Jiayi) prove to be a positive match for bone marrow treatment-- the estranged and happily remarried couple risk the limits of their respective spouses including Mei's incredibly supportive, sweet-natured husband (Cheng Taisheng) who's in fact the only real father that Hehe's ever known as well as Xiao Lu's younger flight attendant wife (Yu Nan). Unwilling to continue feeling powerless, Mei makes the decision to create a new child so that the umbilical cord of a new baby can-- if not cure Hehe-- then give her at least two to five to ten or more years of life since the combination of her blood and her ex-husband's would be the safest match for Hehe. Yet in order to accomplish this, all four adults must address just what this will mean in terms of their relationships as questions of lies, trust, right, wrong, loyalty, and even infidelity enter the equation as just underneath the surface, they try to avoid the realization that despite whatever is decided, the future for all of them is as fragile and unpredictable as ever. All in all, it's a wondrously complex tale about human dynamics, parental love and just how far one will be willing to go even for the most remote chance to save a life (at least for awhile). Still while nothing is clear-cut in Wang Xiaoshuai's film and his predictable unwillingness to offer a traditional uplifting or resolute conclusion may bother some viewers, it's a brilliant piece of work that hearkens back to the movies made by My Sister's Keeper director Nick Cassavetes' father John Cassavetes and one that similarly plays like a chamber piece. In his unique refusal to film specific Chinese landmarks and make the surroundings as unremarkable as ever to show the march towards modernity (yet at the same time the idea that with progress comes a lack of real human connection with one another as we become more and more cut off and isolated in our own dramas), Wang Xiaoshuai manages to tell a story that could in fact take place in any area around the globe. Abandoning the temptation to turn it into a melodrama, a medical crisis picture, or one that serves as a commentary on any social issue in particular (as again he's extremely vague about everything from health care to economics etc.) -- it's the film's simplicity that makes it all the more compelling. Furthermore, it emphasizes the performances of the main quartet of actors (who were deliberately chosen since they weren't "stars" but more reminiscent of "ordinary people") and therefore the results are additionally remarkable. WeiWei's fierce tenacity in her portrayal (akin last month's similarly themed film Under the Bombs about a mother who will do anything to find her son in war torn surroundings) earned her a well-deserved Best Actress Award. Likewise the film itself earned Wang Xiaoshuai another Silver Bear from the Berlin Film Festival for his screenplay as well as a Special Mention Prize of the Ecumenical Jury-- however, overall it's a film that doesn't hit a false note and seems to be enhanced by the collaborative effort of everyone involved as throughout you're invited to view the same situation from four distinctly different points-of-view. Although the subject matter and the fact that it's arriving only weeks before the similarly themed big budget Hollywood effort My Sister's Keeper may hinder traditional viewer interest, for fans of foreign film and especially those who appreciate intellectually, ethically, and morally stimulating pieces you won't do any better than the superlative In Love We Trust.